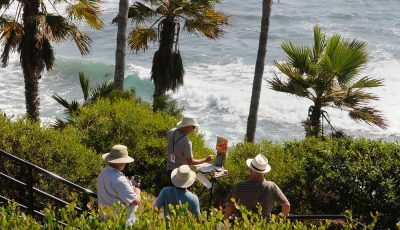 Jorg Dubin is best known in Laguna Beach and environs for his portrayals of hardscrabble characters and as a creator of several works of public art, including a recent commission to design the city’s Sept. 11 memorial. When Dubin turned to paint landscapes, however, his subjects are very specific vistas. In a twist on the Laguna art colony’s legacy of plein-air painters, Dubin recast himself in the plane-air genre, training his eye on the metamorphosis of the former El Toro Marine Corps Air Station into the Orange County Great Park. Collectors and critic praised his work in 2008 when Dubin first presented his dramatic renditions of the deserted runways and deteriorating base buildings set against the bucolic Santa Ana Mountains at the Peter Blake Gallery in Laguna. Now, 18 paintings from that series are the centerpiece of the inaugural exhibition at a gallery in the Great Park’s Squadron Center Arts Complex. A private opening preview is set for Thursday, July 21, from 6 to 8 p.m., while the exhibit opens to the public July 23. Dubin named the show that also includes two sculptures of F-18 fighters “Plane Air Power.” The planes are a tribute to the men who flew them and also the base’s role in shaping Orange County. Photos courtesy of the Great Park Corporation. What sets paintings like Dubin’s “East of Eden,” apart is a depiction of perspective more akin to a pilot landing his jet fighter than a painter standing at the edge of the runway. As he also portrays the hangars and barracks, Dubin’s acute sense of light is ever-present. Light bathes the runways, their insignia strongly delineated while the background, although articulated, is hazier. The view is one Marine pilots may have encountered returning to the base’s two crossing runways on a hot summer day. It’s easy to imagine that Dubin, who is not a pilot, channeled at least one. “Left to R-34,” on the other hand, leaves no doubt that the 4,700-acre military installation where 3,700 military and civilians worked for 50 years up until 1999 has become a ghost city. It’s easy to think of swords turned into cultural plowshares since the new arts complex is comprised of three restored and remodeled squadron buildings. Two were warehouses that have been converted into flexible art studios. Altogether art spaces measure 6,800 square feet, 4000 of which have been dedicated as gallery space. In the Palm Court Yard, ringed by 54 Canary Island palms, visitors will be able to see the outlined footprint of a fourth building. “It serves as a historical marker to honor a building that once housed a squadron,” said Henry Korn, the Great Park’s program officer for arts, culture and heritage. The first group of artists in residence has been selected, said Korn. They have to interface with the public by creating accessible work and keeping open studio hours and, at the end of their residency, are required to create a work of art that relates to the idea behind the Great Park. It has grown to almost 60 acres of public space. During the recent “Grow the Park” event last weekend, 25,000 visitors had a chance to preview the complex. 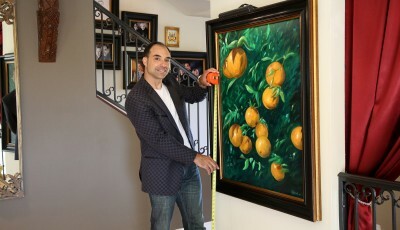 "My Blue Heaven" by Jorg Dubin“Plane Air Power,” July 23-Oct. 16 at Orange County Great Park Palm Court Gallery. Hours: Thursday noon-8 p.m.; Friday noon-4 p.m.; Saturday and Sunday 10 a.m.-4 p.m.